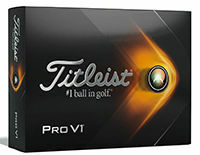 The New Titleist® Pro V1® offers total performance and features more speed for extraordinary distance, very low long game spin, penetrating flight, Drop-and-Stop™ control and very soft feel. #1 Ball on Worldwide Tours. Total Performance for Every Player. Select the type of Packaging you would like. Select the numbers you want. If you selected "Special Number", Enter the Special Number in the box below. Minimum order size for Special Numbers is 12 dozen golf balls. Lead time for Special numbers is 2 weeks plus 3-5 days shipping.